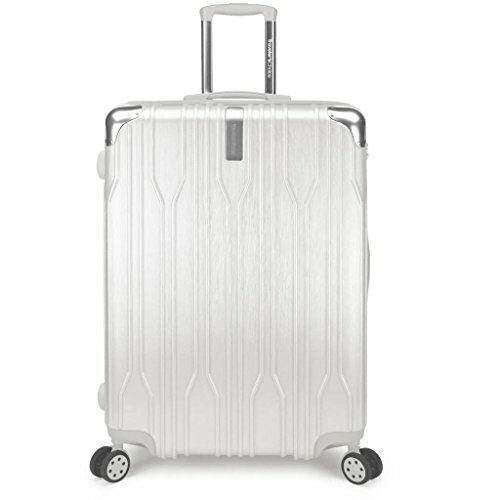 Strong and elegant, The Bell Weather Collection from Traveler's Choice features 4-wheel spinners that allow complete upright mobility without putting any pressure on your arms, ensuring smooth travels to your destination. Hardshell with metallic finish, Aluminum corner guards provide extra protection. Sleek aluminum telescopic handle system features push-button mechanism., 360-degree dual spinner wheels provide effortless maneuverability. Flush-mounted combination lock is TSA compliant., Top and side grab handles allow easy lifting. Overall Dimensions: 28.5" H x 20" W x 12.5" D (+ 2" Exp.) Interior Dimensions: 27" H x 19" W x 12" D (+2" Exp.) Weight: 11.6 lbs. If you have any questions about this product by Traveler's Choice, contact us by completing and submitting the form below. If you are looking for a specif part number, please include it with your message.